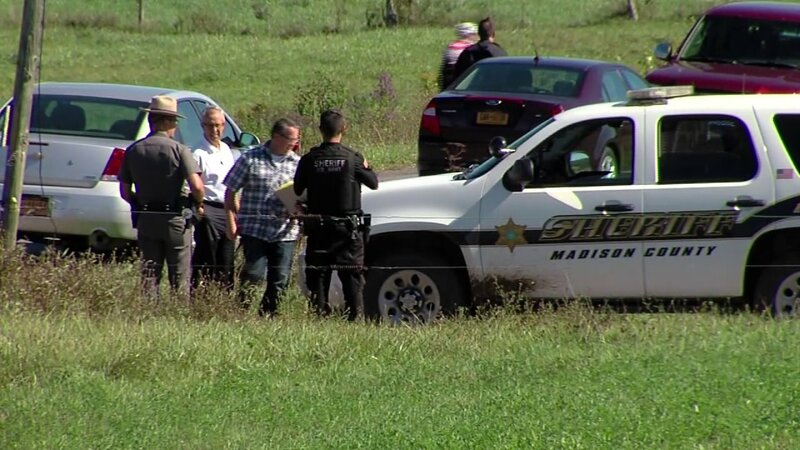 EATON, N.Y. -- A small plane crashed in the woods near a liberal arts college shortly after takeoff, killing the two students aboard, authorities said Monday. Colgate University officials and the Madison County sheriff's office identified the students as Cathryn "Carey" Depuy and Ryan Adams, both 18-year-old freshmen from Ridgefield, Connecticut. The two had just left Hamilton Municipal Airport around 1 p.m. Sunday with Depuy at the controls of the single-engine Cessna 150, police said. It went down in the town of Eaton, a few miles from the Colgate campus. Federal aviation safety officials are investigating. According to Federal Aviation Administration records, Depuy held a student pilot license issued in October 2013. John Goetz, who coached Depuy's cross-country team at Ridgefield High School, said he often spoke with her about flying because he was struck by her achieving a pilot's license at such a young age. "I was fascinated by the fact a high school kid was going out and getting her license," Goetz said. He said they had talked about Depuy taking him up in a plane last winter, though it never happened. Depuy had a black belt in martial arts and ran cross-country to train for lacrosse, Goetz said. In cross-country, her teammates selected her as one of the captains. "She had a great personality," Goetz said. "She's one of these very happy, always smiling, kidding-around-type people. Even when bad things were happening to her, she would still have a smile." Adams graduated from St. Luke's School in New Canaan, Connecticut. He won a school award for an economics paper and played on the varsity squash and golf teams, according to the school's website. "Words can't express the depth of this tragedy and of course the pain it has inflicted on Ryan's family and friends," Mark Davis, the head of school, said in a statement. The school said Ryan became an Eagle Scout by the age of 13 and was vice president of the St. Luke's Investment Club and president of its chapter of Support Our Soldiers. Counseling was being offered at both high schools. Colgate officials have postponed or canceled some of Monday's campus events and are making counseling available. A community vigil has been scheduled for 7:30 p.m. Monday. The only FAA record of an accident involving the plane that crashed was from 1980, when it veered into a snowbank because the pilot lost control on takeoff, possibly because of a frozen wheel.